HomeTelehealth.com from HomeCare Interactive, LLC helps you to afford telehealth and remote monitoring for your chronically ill patients at a fraction of what you pay to any telehealth vendor for a disease management program. With complete interactive assessments and a choice of integrated peripherals, Home Telehealth.com offers a unique tool to manage chronically ill patients in their own homes without compromising, quality or care or even agency's money. Lets face it; the cost and labor involved in most telehealth equipment available in the market today, could not justify the use of those equipment. Nor it can make an ROI we look for. If we call 10 and 20 patients study a success, then what do we call telehealth for 100 or 200 at once. 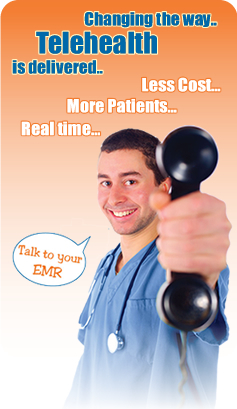 With HomeCare Interactive - Hometelehealth.com, you can see a return on your investment within minutes. In fact, before you even pay. If you sign up for hometelhealth.com program today, you can start saving money immediately by reducing your home health visits and increasing your telehealth assessments and will only be charged at the end of cycle. you will pay pennies instead of hundreds of dollars. There is no comparison. and the quality of care is unprecedented. Do you know that most equipment in the market today work in a store and forward mode. This means they have generic questions, with generic instructions and the data will only be reviewed Monday through Friday by a clinician.